This book brings together ecological-conservation theory and heritage-preservation theory and shows how these two realms have common purpose. 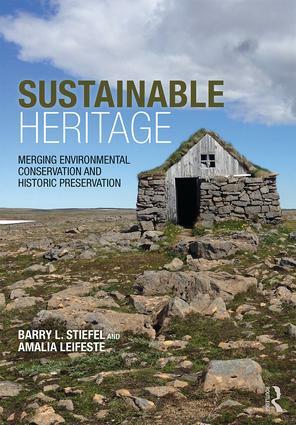 Through theoretical discussion and illustrative examples, Sustainable Heritage reframes the history of multiple movements within preservation and sustainable-design strategies into cross-disciplinary themes. Through topics such as Cultural Relationships with Nature, Ecology, Biodiversity, Energy, and Resource Systems; Integrating Biodiversity into the Built Environment Rehabilitation Practice; Fixing the Shortcomings Within Community Design, Planning, and Policy; Strategies for Adapting Buildings and Structures for Rising Sea Levels; and Vehicles as a Microcosm of Approaching Built Environment Rehabilitation, the book explores contemporary ecological and heritage ethics as a strategy for improving the livability of the built environment. The authors provide a holistic critique of the challenges we face in light of climate and cultural changes occurring from the local to the global level. It synthesizes the best practices offered by separate disciplines as one cohesive way forward toward sustainable design. The authors consider strategies for increasing the physical and cultural longevity of the built environment, why these two are so closely paired, and the potential their overlap offers for sustained and meaningful inhabitation. Sustainable Heritage unites students and professionals in a wide range of disciplines with one common language and more closely aligned sets of objectives for preservation and sustainable design. Amalia Leifeste is an Assistant Professor for the Graduate Program in Historic Preservation co-sponsored by Clemson University, USA, and the College of Charleston, USA. Leifeste sees preservation practice as essential to ‘cultural sustainability.’ She is interested in how we educate practitioners and how place fosters group identity, and, as an architect, in defining how much and what kind of change can keep buildings useful for current needs without erasing essential touchstones of meaning. Barry L. Stiefel is an Associate Professor in the Graduate Program in Historic Preservation co-sponsored by the College of Charleston, USA, and Clemson University, USA. He is interested in how the sum of local preservation efforts affects regional, national, and multinational policies within the fields of cultural and natural heritage conservation, as well as the relationship of these studies to environmental sustainability. Dr. Stiefel has published numerous books and articles, including the book Community-Built: Art, Construction, Preservation, and Place, which he co-edited.